What Did Currency Markets See That You Didn’t? The FOMC’s “surprise hawkish” statement was the biggest market mover of the week. Here’s what we learned. See our special report on this for full details. The past week offered a classic example of why everyone needs to know as much as they can about inter-market correlations, particularly those involving the major currency pairs. 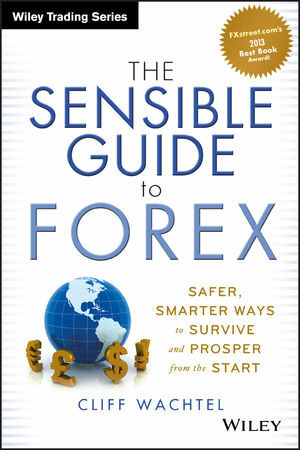 Certain groups of seemingly unrelated assets and currency pairs tend to move in similar or opposite directions. When these positive or negative correlations diverge from their normal behavior – look out! Often these “divergence studies” provide advanced warning of a trend change that can either be very profitable – or very costly if you’re caught unprepared. For those not familiar with the basics of inter-market analysis, its classic correlations and ominous divergences, seehere for a 15 minute read that will make you a much better investor or trader. Here’s the classic “divergence signal” we saw early last week, what it signals, and what it tells us for the future. It’s also a good illustration of the need to understand how the major forex pairs correlate with the major stock indexes. See here and here for details. 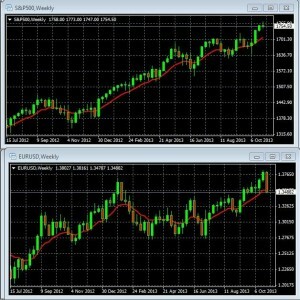 Usually the S&P 500 and EURUSD move in the same direction, as they are both risk assets. As the above charts show the two don’t always move in lock step, but over a typical period of weeks and months their directions are quite similar. When these two diverge, it’s often an advanced warning that one of these is about to reverse its trend. Most of the time, it’s the currency markets that provide the advanced warning for equities. Note in the charts below how the trend divergence began forming back on Thursday October 24th, the prior week (far left of the highlighted areas). 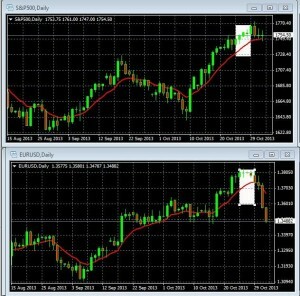 The S&P 500 kept climbing, while the EURUSD stalled out. Then notice how the trend for the Monday and Tuesday candles (October 27-8, the 4th and 5th from the right) prior to the FOMC statement, suddenly diverges, with the S&P holding steady while the EURUSD starts to dive. Often these divergences are just “technical adjustments” (analyst jargon for “no idea why but I’ll offer some intelligent sounding speculations”). However in the context of expectations for an extremely dovish FOMC statement that would virtually assure 6 month or more of uninterrupted QE, equity investors should have been sensitive to the message: that compared to equity traders, currency traders were seeing a higher probability of a less dovish FOMC statement. That would be more bullish for the USD and bearish for the EUR. While the consensus per the financial media was that the fed would make no moves to reduce the dollar-dilutive QE, as usual, forex markets tend to be ahead of the stocks and their leading pundits. In that context of such low expectations for the USD, forex traders sensed that there was more upside than downside potential for the USD from the FOMC meeting Thursday. So traders started bidding up the dollar from the beginning of the week, as we see in the charts below (the same as the above, but these include the US Dollar Index, a broader indicator of USD demand than the EURUSD). 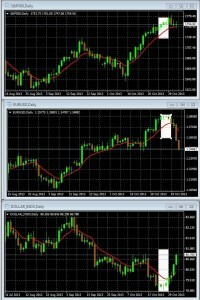 Equity players who noticed the diverging trends of the S&P 500, EURUSD, and the USD index, and who were sensitive enough to this context of extreme sentiment to heed that divergence, had advanced warning that one of these trends was due to reverse. They proved correct. As noted in our special report on the FOMC statement and its lesson here, a few subtle differences in the expected wording of the statement was all it took to reduce QE expectations and spark a USD rally. No material drop in risk appetite. Note how the S&P 500 above (a favorite risk barometer) stalled but did not show any meaningful retreat, at least not yet, although those final doji-shape candles suggest a higher probability of a pullback. That would not be surprising given that markets have been moving with QE expectations, which have just been pared back a bit. US data was mixed at best, so there was no fundamental support for suspicions that the FOMC would be any more hawkish than predicted. In sum, expectations for the USD got too low. However based on the likely direction of the US economy, we still do not believe there will be any material change in Fed policy until well into 2014. See here for why and how to profit. No doubt the USD rally was aided by some fundamental and technical headwinds facing the EURUSD. See the following section on the EURUSD outlook for more on this. Low inflation data, high unemployment, and dovish remarks from a senior ECB official fed speculation that the ECB may need to ease monetary policy, which would weaken the EUR. 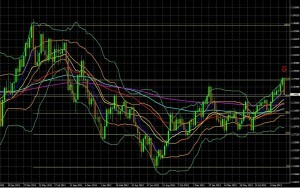 The EURUSD rally that had begun in July 2012 had hit strong technical resistance of its 61.8% Fibonacci retracement of its prior high in May 2011. See our most recent weekly EURUSD outlook here for more on this. Last week markets were worried about rising Chinese benchmark short term interest rates. This week that continued, but it didn’t bother markets, because these are believed to be due to temporary seasonal factors, and it’s believed that if needed the PBOC will intervene. Perhaps part of the reason for that calm was the widespread improving data in Asian manufacturing. While the fed may be the most dovish central bank at the moment, we all know that the ECB, BoJ and BoE remain in easing mode as well. Those with most of their assets denominated in the USD, EUR, JPY or GBP need to diversify their currency exposure. There are a variety of simple, safe ways to do that. See here or here for details. See here for the major market movers for the coming week.